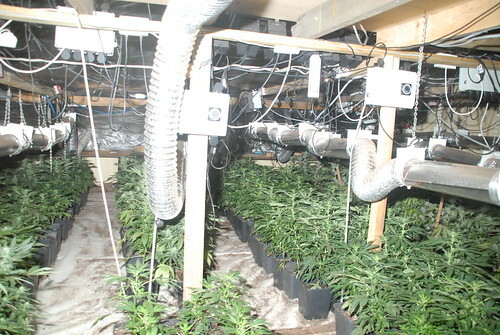 The cannabis farm was found inside an industrial unit at Hadrian Enterprise Park in Haltwhistle, Northumberland. On Friday February 17th officers executed a search warrant at the unit after information from a member of the public. Inside they found a number of plants and cultivation equipment - the exact number are not yet known. Since Friday the unit has been secured by officers while plans are being put in place to search and dismantle the farm. "Early searches of the premises indicate the unit has a number of floors filled with cannabis plants and cultivation equipment. "Officers have had difficulties getting into and searching the unit for safety reasons and with any operation of this nature, ensuring officer safety is paramount. "We have the site secured and are making plans to get inside and seize and dispose of the drugs and equipment. "Disrupting criminal activity on this scale is a great result for the force and I want to reassure people we're doing everything we can to find out who is responsible for setting up this cannabis farm. "There's no place for this sort of activity in our communities." Anyone with information about drug use or supply in their community should contact police on 101 ext 69191, or Crimestoppers anonymously on 0800 555 111.